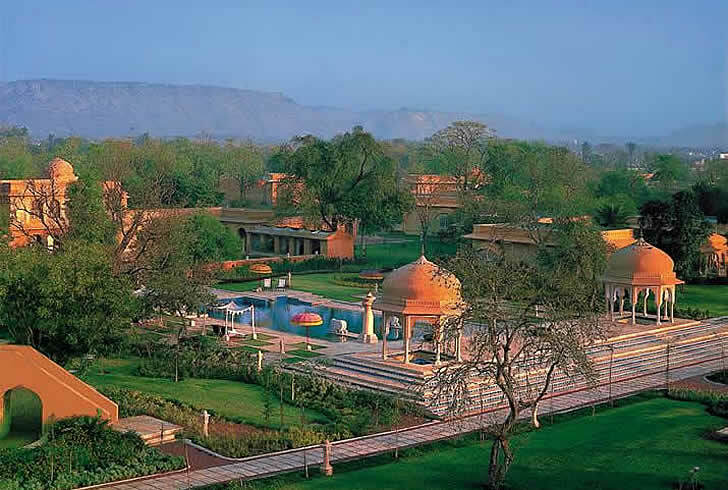 The Pink City, home of the Maharani Gayatri Devi, renowned princess and rider of elephants, is the backdrop for one of the most lavish properties of India. Accommodations run the gamut from private pool suites to luxury air-conditioned Rajasthani tents with teak floors and soaking tubs. Jaipur is known as the pink city for many purported reasons, the most likely of which is that the structures in the old walled city are built with pink sandstone. It is also the home of the Maharani Gayatri Devi and, as I had been reading about her before embarking on this trip, Jaipur had already captured my heart before I arrived. She is the daughter of the Maharaja of Cooch Behar and the widow of Jai, the Maharaja of Jaipur. She was raised in a palace that housed hundreds of servants with a paddock of just as many elephants. In her youth, she was known to be one of the ten most beautiful women in the world. She managed a six-year clandestine courtship with Jai, as handsome as he was dynamic, and ultimately became his third wife, entering into a marriage of choice rather than one chosen by her family for the purpose of strategic alliance, as was so common in her day. Yes, this is the stuff that fairytales are made of; it doesn't get more romantic than this. Our hotel, the Oberoi Rajvilas, was an absolute oasis. 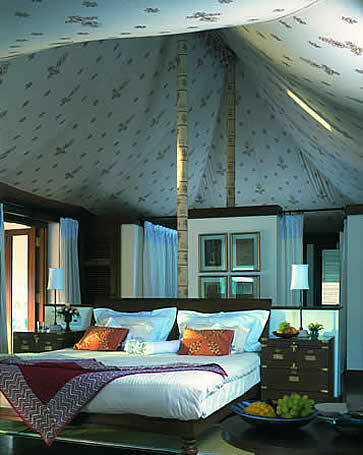 All the rooms are clustered in fours and sixes around private courtyards and some are air-conditioned luxury tents with lavish bathrooms and teak floors. Each of them have four poster beds and sunken marble baths overlooking private walled gardens, but our suite also had a private pool, large courtyard and tented eating area. Our morning routine started with a wake-up swim, followed by breakfast served pool-side, monkeys eyeing us (or our food) from the wall surrounding our courtyard, but fortunately too shy to attempt a French Toast coup. Our evening included a skinny-dip followed by a cool glass of imported French wine. Life at Rajvilas is tough, but someone has to do it! A brief mention to a staff member, that we were celebrating our twentieth anniversary, prompted such special events, that I hope others will follow in our footsteps. We had a romantic private dinner for two in an elevated private dining area overlooking the Oberoi Rajvilas' two hundred and fifty-eight year old Shiva Temple. Candles lit the path up the stairs to our table and surrounded the platform. Our own private waiter served the entire meal and catered to our every whim. 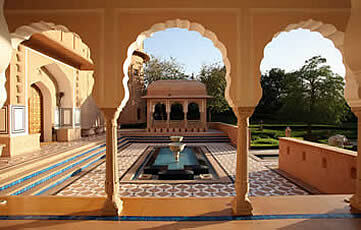 Rajvilas is no stranger to romance and regularly hosts honeymooners. Packages include a wedding blessing ceremony commemorating the marriage, as well as assistance with the bridal sari and ceremonial jewelry. Brides arrive at the Rajvilas temple in a horse-drawn carriage. They also include a dinner similar to our anniversary experience and a special bridal beauty treatment in their elegant Oberoi spa for the bride, among other deliciously romantic moments. The Royal Welcome, complete with musicians, horses, elephants and numerous attendants showering flowers can be ordered separately, should the initial pomp and circumstance prove inadequate for your tastes. If you're an early riser, a morning excursion to Amber Fort is a good choice. There is the possibility of an elephant ride up the hill to the fort if you arrive early enough. In an effort to control pachyderm tempers, that might flare in hot weather or under strenuous conditions, the Indian Department of Tourism doesn't allow the elephants to take more than three trips a day and by 9 am eager tourists have already reached the maximum. A combination of Hindu and Mughal architecture, its construction was begun by Raja Man Singh I in 1592 and was finally completed by Sawai Jai Singh I. Built in red sandstone and white marble, it completely overwhelms the visitors with its delicate and complex carvings, frescos, inlayed mosaic, and colored glass. The City Palace complex is divided into a series of courtyards, sprawling gardens and buildings. It is home to several palatial structures including the Chandra Mahal, Mubarak Mahal, Badal Mahal, Shri Govind Dev Temple and the City Palace Museum which houses a museum containing rare manuscripts, paintings and an armory. Another well-known sight, the Jantar Mantar Observatory, built by Maharaja Jai Singh II between 1727 and 1733, consists of fourteen major geometric devices for measuring time, predicting eclipses, tracking stars in their orbits, ascertaining the declinations of planets, and determining the celestial altitudes and related ephemerides. The Samrat Jantar, the largest instrument, is 90 feet high, its shadow carefully plotted to tell the time of day. Its face is angled at 27 degrees, the latitude of Jaipur. We passed the Hawa Mahal, also known as the 'Palace of Winds'. It is the best-known landmark of Jaipur, and was used by the ladies of the court to watch the daily goings-on in the street below. The Maharani Gayatri Devi would have used it to watch the processions in her time, the royal musicians playing, elephants adorned with gemmed head-pieces, and rose petals being strewn from the palace walls. 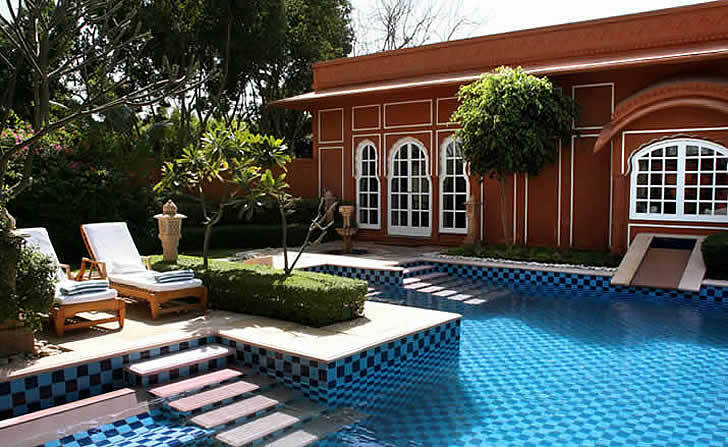 She lives now in Lily Pool, the former guest quarters of Rambagh Palace, one of the palaces where she once lived in lavish opulence, but which has now been converted into a Taj Hotel. She seems to me a reverse-Cinderella, and being in these historic palaces where she once held court, I wonder how she survived the transition from her fairytale existence to private life. Style Mughul architecture; clusters of individual units. Setting Resort in a small city. 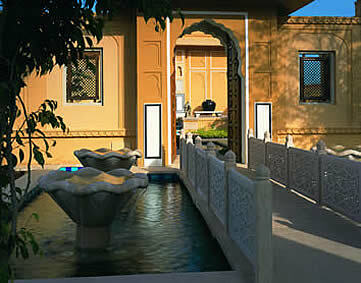 Why you'll love it The oasis of gardens and private courtyards embellished with pavilions and pools. Good to know The pool suites are heaven; you can order private dining; possibility of royal welcome, complete with elephants. Dining The Surya Mahal restaurant offers Indian cuisine in an elegant environment of hand-carved pillars and hand-painted archways. Address Goner Road, Jaipur, Rajasthan 303 012. How to Get There Private car from Agra. 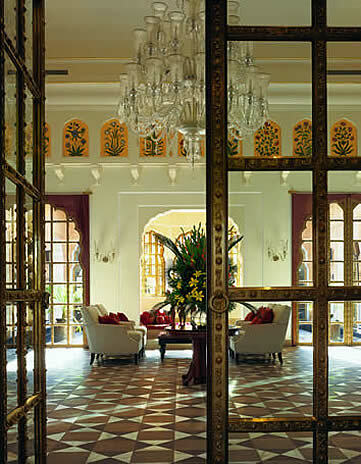 Hi, The Oberoi Rajvilas looks wonderful. Do you have any rooms available in March next year? Thanks. Jaipur is a shoppers' paradise. There are hand-blocked fabrics and custom-made clothing of silk, organza, cotton, and linen, gems and silver jewelry, and outstanding miniature painting. Sodhis has great fabrics and a wonderful demonstration of hand-stamp blocking (hand blocks), silks, cottons, organza, and pashmina. They can make you anything you like. Bring something from home that you want copied in multiple colors, as I did. Or choose a style there and they will measure you and make you a custom-product. They also have textiles and home furnishings. Address G-9 Opp. Jai Mahal Amer Road, Jaipur. Bhandari Jewellers does a great gem polishing demonstration and their precious and semi-precious gems are of good quality. Settings for the stones are creative and varied. Address 5 Dushera Kothi, Amer Road, Jaipur. Rajwada Exports has a good selection of fabrics, textiles, and other souvenirs. Address Inside the Sawaiman Singh II Museum Trust City Palace, Jaipur 302002 India.